Seeking to improve our understanding of physical and biological cohesion in sediment transport for a range of applications. Estuaries are dominated by cohesive muddy sediments, typically composed of a combination of clay minerals and biological matter. Cohesion arises through the combined efforts of both mineral cohesion through the electrostatic charging of the clay minerals, and biological cohesion through various ‘biopolymers’ generated by benthic organisms that adhere to individual particle surfaces. In contrast to non-cohesive sandy sediments, suspended cohesive sediment particles can flocculate in to larger aggregates. Flocculation is therefore a principle mechanism which controls how fine sediments are transported throughout an estuary, and this poses a serious complication to modellers of estuarine sediment dynamics. Similarly, bedload transport and bed morphology, e.g. ripples, dunes, sandwaves are major roughness elements in most environmental fluid flows and are fundamental in mediating fluxes of particulate and dissolved matter in many terrestrial and marine environments. However, our existing knowledge of bedform dynamics, and the interface between bed and suspended load, is entirely based on non-organic cohesionless sands, despite the fact that mud, in pure form or mixed with sand is the most common sediment on Earth. Accurately predicting the movement of muddy sediments, in either bedload or suspended form, in estuaries is therefore highly desirable. We seek to improve our understanding of physical and biological cohesion in sediment transport for a range of applications including flood event simulation, environmental management (e.g. pollution transport), siltation of harbours and channels, assessment of engineering infrastructure stability, and paleo-environmental interpretation. This includes the development of INSSEV and LabSFLOC instruments, designed to characterize flocculated sediments. COHBED is a research project funded by the Natural Environmental Research Council (NERC, UK). 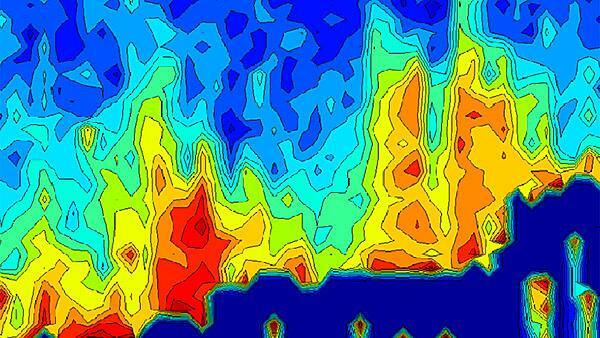 The project aim is to examine bedform dynamics in mixed sediment coastal environments. The COHBED project has partners from University of Wales - Bangor, University of Plymouth, NOC-Liverpool, University of St. Andrews, and University of Hull. The project encompasses flume experiments and fieldwork. Flume experiments were undertaken on both ripple and dune scales where sand, clay and biopolymer contents were carefully selected to reveal the control of mineral and biological cohesion on bedform morphology (both development and equilibrium states). Figure 1 shows the effect of clay content on bedform morphology in the dune regime. A detailed fieldwork campaign examining the changing morphology of intertidal ripple and subtidal dune fields was completed in June 2013. A large range of apparatus was deployed, including state-of-the-art methods of coupling flow, bedform and suspended sediment dynamics. Figure 2 shows a fraction of the instrumentation used. The data image is from the unique BASSI instrument developed at the National Oceanographic Centre, Liverpool. Work undertaken by the University of St Andrews has quantified and characterized the effects of biopolymers in both flume and field experiments. Figure 3 shows the binding of mineral grains by biopolymers that is ultimately responsible for additional bed stability. The project will ultimately develop processed-based predictive models for ripple and dune morphologies for natural environments containing mixed sediments. The effects of biological cohesivity on a range of flow-sediment interactions are poorly understood. Furthermore, the influence of organic matter on the cycling, bioavailability and transport of metals is well documented for a variety materials, including humic/fulvic acids, colloids and algal exudates. However, little is known about how the biological cohesion of sediments modifies contaminant transport pathways in dynamic waterways, such as estuaries. Through controlled examination of the biological component of muds we expect to gain a greater understanding of real-world controls on sediment transport and associated metal contaminants. Extra-cellular polymeric substances (EPS) are natural polymers that are secreted by micro-organisms within muddy substrates. Recent research on the NERC-funded COHBED project (see above) shows that EPS creates sticky bonds between grains resulting in the inhibition of bed erosion an order of magnitude greater than that of cohesive minerals. Conversely, EPS appears to enhance flocculation. There are no published works examining how EPS modifies flocculation. Second, there has been little consideration of EPS's role in modifying the sorption of metal contaminants despite a proven association of metals with flocculated sediments in coastal waters. The proposed research, starting in Spring 2014, will explicitly address these gaps. Figure 1: Comparison of flume-generated sand bedform fields with (left) low clay content (4.8%) yielding large dune forms and (right) high clay contents (14.1%) that inhibit bedform growth. All other conditions were the same, indicating the significant role clay has in dictating bedform morphology. Figure 2: Intertidal field deployment at the Dee Estuary, a site of variable mixed cohesive/sand content. Data image shows instantaneous bed morphology over a ripple field, with suspended sediment concentration distribution above the bed (g L-1), measured using the Bedform and Suspended Sediment Imager (BASSI). Figure 3: Electron microscope images of muddy sediments with varying biopolymer content: (left) a sand-clay matrix with biopolymer coating; (centre) sand grains blanketed by a biopolymer surface in the lee of a dune crest; (right) sand grains with diatoms and minimal biopolymer. Scale bar is 100 micrometers. Figure 4: Suspended sediment transport in the upper Tamar Estuary over a tidal cycle parameterised using microfloc and macrofloc settling velocities. This research project consisted of the development of new physics-based formulations for the settling velocity and mass settling flux (the product of settling velocity and sediment concentration) of flocculated estuarine mud. Based on assumptions of a two-class floc population (microflocs and macroflocs) in quasi-equilibrium with the flow the settling velocities of microflocs and macroflocs were related to floc size and density via the Kolmogorov microscale as a function of turbulent shear-stress and sediment concentration, including height-dependence and floc-density-dependence. Coefficients in the formulae were calibrated against an existing large data-set of in-situ observations of floc size and settling velocity from two estuaries. Various measures of performance showed that the resulting formulae achieve a good level of agreement with data compared with other published prediction methods. Project partners at HR Wallingford are: Professor Richard Soulsby, Professor Richard Whitehouse and Dr Jez Spearman. A paper has been submitted to Marine Geology. In addition, HEIF: ‘Higher Education Innovation Funding’ was awarded through the University of Plymouth's Marine Institute. This enabled project team to establish academic research collaboration with the Coasts and Estuaries Group at HR Wallingford. The project included the examination of Tamar Estuary (UK) sediment dynamics data sets and implement them in HR Wallingford 3D numerical models (e.g. Telemac-3D, Delwaq 3D) for ‘benchmark’ testing (Figure 4). Dr Manning presented HEIF findings at the INTERCOH-2011 conference on cohesive sediment transport in Shanghai, China (October 2011). Dr Manning was awarded a Visiting Research Fellowship by the University of Joseph Fourier (UJF, Grenoble, France). This provides Dr Manning the opportunity to visit the UJF as guests of the French research group Laboratoire d'étude des Transferts en Hydrologie et Environment (LTHE). Dr Manning and LTHE scientists are currently collaborating with the LEGI (Grenoble) hydraulics laboratory, where they are conducting experiments in a diffuse turbulent grid tank on various sediments types from watershed environments in southern France, prior to them entering the aquatic environment. In addition, Dr Manning is a project partner and a named ‘International Expert’ affiliated to the new LTHE ‘SCAF’ (System for the characterisation of aggregates and flocs in highly concentrated rivers) project. This project is in collaboration with EDF research. Researchers have participated in three spatial in-situ measurement campaigns of hydrodynamics and cohesive sedimentation throughout the Seine Estuary, France for numerical modelling calibration, process observation and instrument inter-calibration. This was in collaboration with IFREMER (France) and the University of South Carolina (USA). FLOCSAM: 'Acoustic and optical backscatter from flocculating sediments' is a research project funded by the Natural Environmental Research Council (NERC, UK). The project aim was to examine the response of acoustic devices to suspended flocculating sediment. Flocculation and acoustics were examined from a predominantly theoretical and fundamental perspective. Field experiments using research Acoustic Backscatter Sensors, ADV turbulence sensors, together with the LabSFLOC & INSSEV floc cameras were co-ordinated in the Tamar Estuary (UK) (Figure 5). Project partners include: University of East Anglia and National Oceanography Centre - Liverpool. Figure 5: Scatter plots of floc populations acquired via the LabSFLOC video system at discrete points over a tidal cycle in the upper Tamar Estuary. The x-axis shows floc size; the y-axis shows settling velocity; diagonal lines are effective densities of 1600 (solid), 160 (dashes) and 16 (dots) kg m-3.